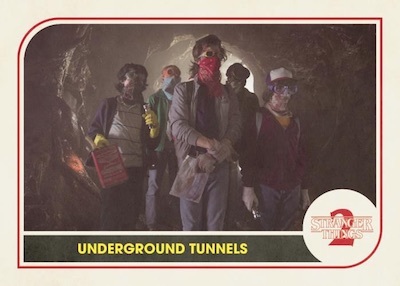 Embracing the style of the '80s even more, 2019 Topps Stranger Things Season 2 returns to Hawkins for another run of spooky trading cards. Joining the Season 1 set from 2018, each Hobby box promises two hits with one guaranteed to be an autograph or sketch card. Fans of the series know that nothing is what it seems in the small Indiana town. 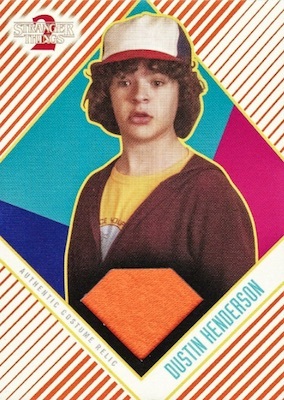 The 100-card base set summarizes the events of the second season, which initially released in October 2017. For the parallels, Upside Down (#/99), Waffle (#/11) and Printing Plates (1/1) editions are back. The new choice is the one-of-one Illustrated Art parallel. 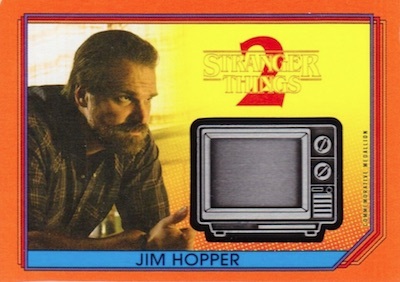 2019 Topps Stranger Things Season 2 also supplies an updated assortment of Character Card and Character Sticker inserts. Each highlights 20 key subjects from the nine-episode season. There are 20 new Scene Sticker cards, as well. 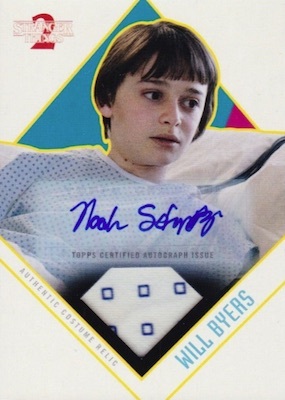 As mentioned, the 2019 Topps Stranger Things Season 2 checklist delivers two hits per Hobby box and at least one should be an autograph or hand-drawn sketch. Centering on cast and crew, the base Autograph set offers Orange (#/99), Green (#/50), Purple (#/25), Blue (#/10), and Gold (1/1) parallels. Very limited multi-subject options include Dual Autographs (#/10) and Triple Autographs (#/10). 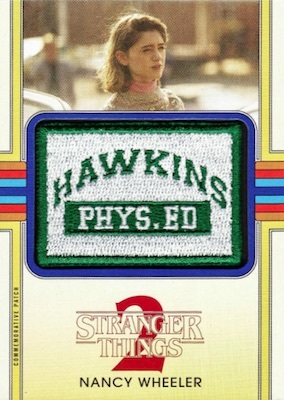 Expanding the relic selection in 2019 Topps Stranger Things Season 2 are the new Commemorative Medallion cards. These join the Commemorative Patch cards and Costume Relics. Relic inserts come in Orange (#/99), Green (#/50), Purple (#/25), Blue (#/10), and Gold (1/1) parallels, as well as an Autograph version (#/10). Dual Relic cards add only Purple (#/25), Blue (#/10), and Gold (1/1) parallels. 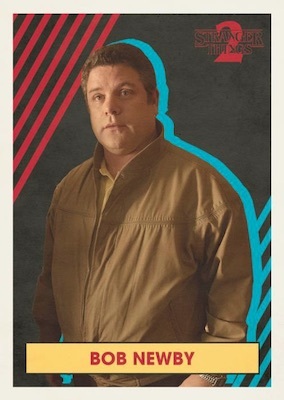 The final hit possibility, Sketch cards and Shaped Sketch cards deliver limited artistic interpretations of key characters and scenes from Season 2. 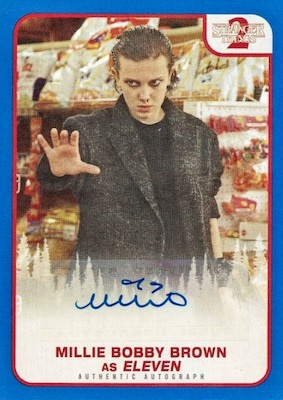 Shop Stranger Things boxes diret from Topps. 100 cards. Buy complete sets on eBay. PARALLEL CARDS: Upside Down #/99, Waffle #/11, Illustrated Art 1/1, Printing Plates 1/1. 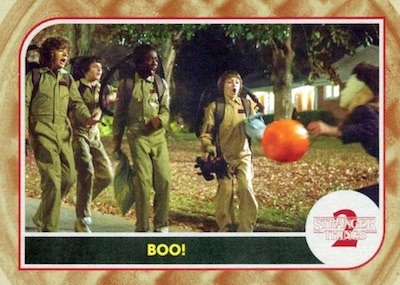 Buy Stranger Things Season 2 autographs on eBay. PARALLEL CARDS: Orange #/99, Green #/50, Purple #/25, Blue #/10, Gold 1/1. 6 card. Serial numbered #/10. PARALLEL CARDS: Purple #/25, Blue #/10, Gold 1/1. A clearly inferior product when compared to the previous release. 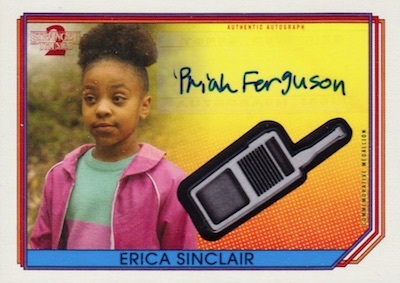 Sketch cards are EXTREMELY rare and this set is flooded with actors who appeared in just one or two episodes. My case yield NONE of the main cast. Pass on this product and just buy your singles off of ebay. Is there going to be a retail release of this? Retail was mentioned when the set was first announced but nothing new has been seen since then. 2018 Topps Stranger Things Trading Cards HOBBY BOX Brand New SEALED! !